It is a little after 1 PM in the afternoon, and I’m sitting in our van reading my Bible. Not long from now I will go back to work and drive the school bus, completing my afternoon routes. As I was reading I came across a verse in the book of Lamentations, and I thought I would share it with you. Lamentations 3:39 (CSB) Why should any living person complain, any man, because of the punishment for his sins? Here the idea is that if you have been punished for your sins by a Holy God, and are still alive, you have nothing to complain about! Seriously, too often we gripe and moan about the circumstances which we must endure, and yet those circumstances are so often the result of our own sinful decisions. Is it not a wonderful thing that we are so loved by our heavenly Father? He does not pour out on us the punishment we deserve, because he is rich in mercy. We are alive! We should be grateful! There are so many things in this world we could complain about. So often those who complain the most are the ones who have the most. But if there’s anything worth rejoicing about, it is the fact that we serve a God who is rich in mercy. We don’t deserve anything good, no matter how small or insignificant; we deserve judgement. 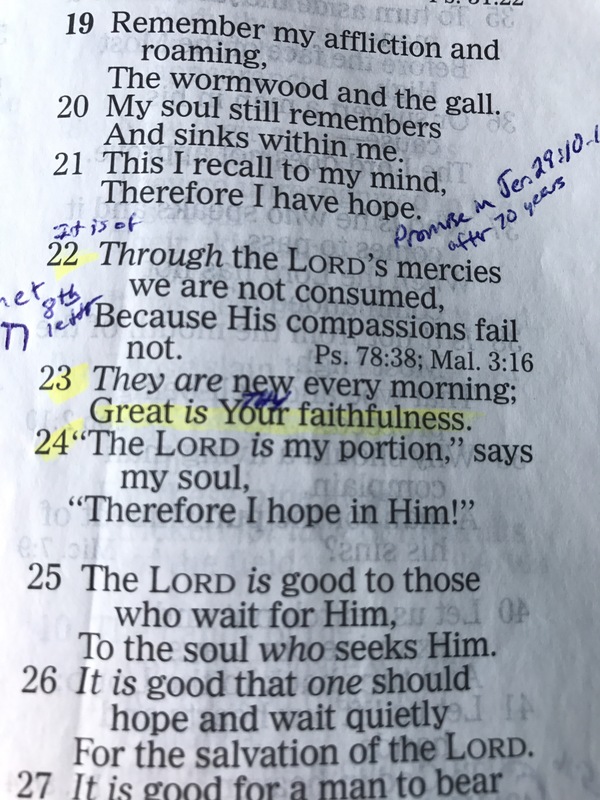 However, if I just turn back one page in my Bible I can read verse 22, where it says, “Through the LORD’S mercies we are not consumed, because his compassions fail not.” And, thankfully, they are new every morning! If you are reading this, then you are alive! Why not take a moment and praise Him? Most definitely! In Precept Upon Precept class for Jeremiah and Lamentations is next. Precept as in Kay Arthur and Precept Ministries? That’s the one. She has been a big help in my spiritual growth for 14 years now. Not trying to pry, but do you attend classes here in Chattanooga? My wife and daughters have gone there (lunch is awesome). My thoughts exactly. Negativity starts from within and destroys the soul. We need to focus on the positive and be grateful.